Scott Beil facilitating for James Lane, an artist who has been with the program from the beginning. While studying arts education at The College of New Jersey, Scott Beil, who grew up in Chester, NJ, volunteered in Matheny’s Arts Access Program during the summer. He was so taken by the Arts Access concept that he trained to become a facilitator, eventually becoming studio manager. 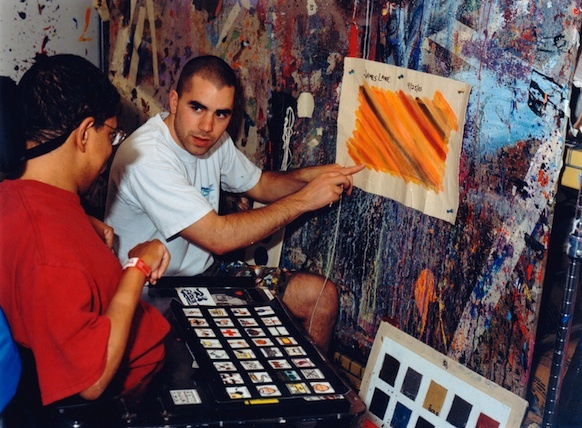 Arts Access enables people with disabilities to create fine art, assisted by professional artist-facilitators. Beil left Matheny in 2007 to join the Willow School in Gladstone, NJ, where he is art teacher, co-director of the middle school and an advisor. However, when Arts Access celebrates its 20th anniversary at Full Circle 2013: Reflections on Saturday, November 2, Beil will be returning as curator of the visual arts exhibit. A working artist whose paintings and drawings have been shown at galleries in New Jersey and New York City, Beil received the Somerset Cultural and Heritage Commission’s “Excellence in the Arts” award in 2007. He was recently accepted into the “Connecting Collections Program,” a prestigious summer institute for teachers from around the world, hosted by New York City’s top museums including the Museum of Modern Art, the Guggenheim and the Whitney. Full Circle 2013: Reflections will be held from 3-6 p.m. on Saturday, November 2, in the Robert Schonhorn Arts Center at Matheny. For more information or to order tickets ($30), call (908) 234-0011, ext. 260, or email pcats@matheny.org. This entry was posted in Uncategorized and tagged Arts Access, Full Circle, Scott Beil. Bookmark the permalink.